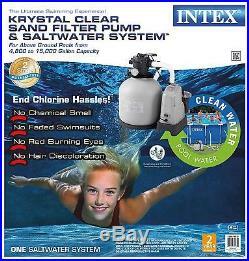 Intex Krystal Clear 2650 GPH Saltwater System & Sand Filter Pump Pool Set Parts. 2650 GPH saltwater system for above ground pool. Powerful 2,650 GPH pump keeps your water sparkling clean. Pump flow rate: 2,650 GPH. System flow rate: 2,150 GPH. Designed for use with above ground pools from 4,800 to 15,000 gallon capacity. Keep your above ground pool water clean, fresh, and sparkling with the Intex Krystal Clear Sand Filter Pump & Saltwater System. The all natural sand provides excellent water filtration as the 6 function control valve allows the pool owner to: filter, backwash and rinse, recirculate, drain, and close the system. The built in 24 hour timer adds to the hassle free experience with maintaining a cleaner pool. 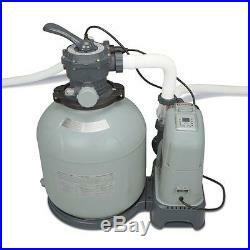 The Krystal Clear Sand Filter Pump generates a pump flow rate of 2,650 gallons per hour, ideal for above ground pools. Equipped with the Ground Fault Circuit Interrupter, which is an added safety feature that shuts off the pump if electrical current is exposed to water. This economical and environmentally friendly pump requires virtually no maintenance except replacement of sand every 5 years. S electroatalytic oxidation process, water molecules are split into highly powerful oxidants which destroy organic contaminants. The amount of natural chlorine generated by the saltwater system is reduced by approximately 60%, much less than other saltwater systems generate. 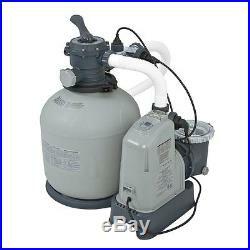 The Saltwater System generates a pump flow rate of 2,650 gph and a system flow rate of 2,150 gph. The result is soft, fresh, clean water without the potential harsh side effects of packaged pool chemicals. Use with a maximum pool size of 15,000 gallons. Simple to use and easy operation that will outperform your standard cartridge filter systems. Easy operation 6 way filter valve makes maintenance easy, giving options to backwash, rinse, recirculate, drain, filter, and close system. 2 sections of 1.5 inch hoses included. Both systems are controlled automatically with a built in 24 hour timer to make daily operation carefree and easy. Strainer basket included on pump prolongs the life of the sand and is easy cleaning. Saltwater system combines a unique 2 stage technology to sanitize your pool. First, an undetectable level of natural swimmer safe chlorine is produced when environmentally friendly natural salt is added to the pool water and passes through a titanium coated electrolytic cell during the filtration process. Second, with the copper ionization feature, highly active disinfectant ions are released creating a potent biocide to attack algae more aggressively than chlorine or other packaged pool chemicals. GFCI electrical protection, works with your standard 110 120V outlet. 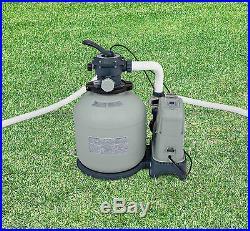 100 pound sand capacity or 70 pounds glass filtration media capacity. All Intex products are rigorously tested and meet all international safety standards to provide years of fun for customers in over 100 countries throughout the world. Cancelling Your Order: Your order is important to us and will be processed immediately. Select the reason for the return. This listing is currently undergoing maintenance, we apologise for any inconvenience caused. 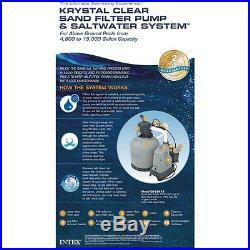 The item "Intex Krystal Clear 2650 GPH Saltwater System & Sand Filter Pump Pool Set Parts" is in sale since Tuesday, December 16, 2014.